Turnkey Property Investments: What Could Go Wrong? Investing in turnkey real estate is a strategy that seems ideal and like a great way to make extra income. Basically, you invest in a property that’s managed by a turnkey property management company that will be responsible for everything from rehabbing the property to managing it. This company not only takes the heavy lifting out of your hands, but simplifies the process by managing your property for you. It’s a strategy that has attracted many investors hoping to reap the benefit of owning a rental property that could be a long distance from where they live. 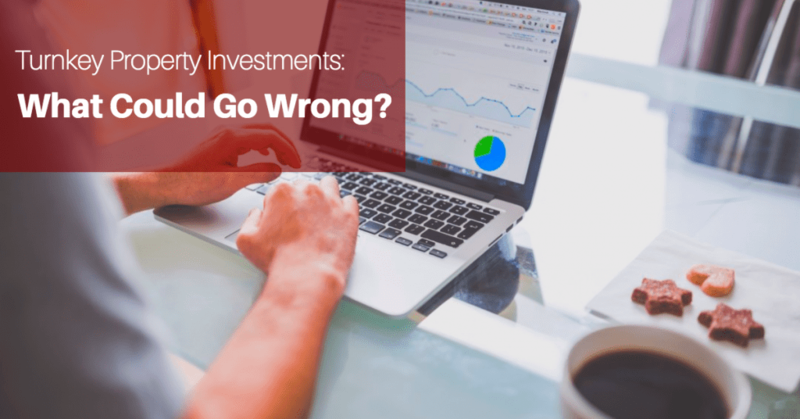 But is it an investment strategy that’s right for you? Before you dive in, you should fully understand the risks and downsides of turnkey property investments—and learn how to minimize those risks so you’ll take away the passive income you’ve been hoping for. Let’s first take a quick look at some advantages of turnkey investing, some of which we’ve already touched on. They would include service at a distance (you can invest in a real estate market without actually having to be there), the market insight of a person who lives in that market, management experience, and a professional staff who will make sure that your property is taken care of. Sounds great, right? Read more about the benefits of working with a great turnkey property management company. What Are the Risks of Turnkey Property Investments? It takes a high level of trust. Turnkey investing requires that you put a high level of trust in a turnkey company that could be in a different state. You’re relying on their knowledge to choose a property, a tenant, and then manage that tenant/property. You’re likely buying in an unknown territory. Many turnkey property opportunities are in cities or other locales that you’re not familiar with. It can be a scary, and risky, proposition to buy a property in an area that you don’t know like your own market. It’s possible that you’d be buying at retail price. One fundamental of real estate investing is that it’s best to buy a property below retail value—which is how most real estate investors make money. When you’re buying a turnkey property, chances are good that you’ll be paying retail value for it. You pay for ease of service. As mentioned, investing in turnkey properties takes the hassles of day-to-day management out of your hands. The turnkey property manager makes money managing the property for you, and it only makes sense that you’ll pay a bit for that service. Still, chances are good that you’ll come out ahead if you’re working with a good company—just think of how much money you’d spend trying to do everything yourself and all of the costly mistakes you might make trying to manage things from afar. Working with a poor property management company will cost you. This risk ties in with the amount of trust you must place in a turnkey property management company that may be in another state. A poor property manager can cost you money and create high levels of frustration. There are ways to interview property managers and gather data about them, but some turnkey companies are new and don’t have a lot of background information. New turnkey providers are sprouting everyday and sometimes the services the offer are not up to par—poor management, poor pricing, poor customer service, and more. So, make sure you’ve vetted your company thoroughly. While turnkey investing can come with risks, working with a seasoned property management company that specializes in turnkey properties will minimize these risks. The property management company will help you choose a property that is truly turnkey—needs few, if any, renovations—and is in the right part of town to assure quality tenants. The company will also provide professional management of the property, and handle all the day-to-day maintenance of the property and customer service. Since 2006, JWB has helped over 400 investors earn passive income and above average returns on their turnkey rental property investments. Learn more about how JWB can help you!